I have enough coming out in 2018 that some of the different campaigns are colliding a bit. Some are self-pubbed projects, others are with presses but I’m helping with the marketing where I can. If you’re someone who would like a review copy or copies of any of the following, please drop me a line with your contact info, where your reviews appear, title(s), what format you prefer, and where to send it. I don’t mind sending e-copies out to people who want to review it on Amazon, GoodReads, etc, but be aware that requests for physical copies may both take longer and that I have a limited number available, so I try to send those where I get the most bang for the buck that’s coming out of my pocket. If you’ve got a podcast and would like me to appear, I’m happy to send copies of my work beforehand. 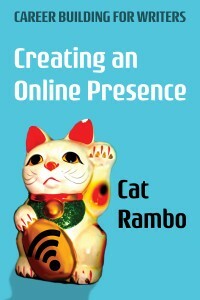 Creating an Online Presence for Writers, 3rd edition. (Plunkett Press). Nonfiction, covers how to create and maintain an online presence in order to build a writerly brand and sell books. Appearing in July. 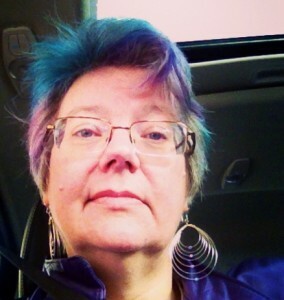 Godfall and Other Stories by Sandra Odell is a collection from Hydra House that I’m editing. 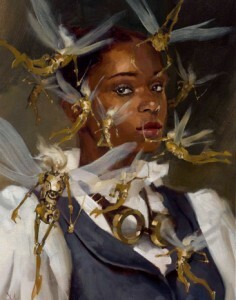 These stories are both fantasy and science fiction, and are usually on the darker side, with occasional flashes of humor. They’re wrenchingly strong at times, and I’m very excited to be one of the people making this book real. Appearing in mid-April. 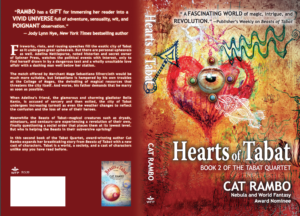 Hearts of Tabat (WordFire Press). 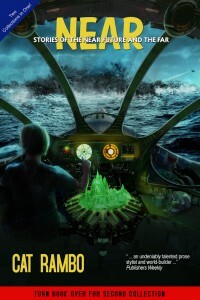 Novel, secondary world fantasy. While this is the second book of the Tabat Quartet, you do not need to have read Beasts of Tabat to understand it. Appearing in mid-May. If This Goes On (Parvus Press) is an anthology of political science fiction focusing on what the world will look like a generation from now. Open for submissions through the end of March, the anthology will appear in conjunction with the 2018 elections. Moving From Idea to Finished Draft. (Plunkett Press) Nonfiction writing book based on this class, which contains stories illustrating each section. Appearing in April. Tales of Tabat (Plunkett Press) is a collection of all the short stories and novelettes set in Tabat, including several pieces original to the collection. I’ve got that tentatively slated for September. The World Made Flash. Plunkett Press. 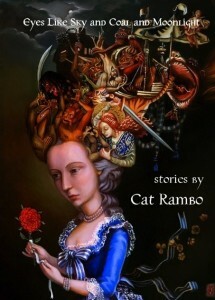 A collection of all my flash pieces along with several essays about writing very short fiction should appear in July. I am also re-releasing my first solo fantasy collection, Eyes Like Sky and Coal and Moonlightin print form, and a new version of steampunk collection Altered America with the horrible typos removed in both electronic and print form. If you’re promoting your own book this year and are interested in doing a guest post here, let me know! Here’s my guidelines for guest posts. This entry was posted in publications and tagged ARC, flash fiction, idea to draft, if this goes on, review copy, steampunk, Tabat. Bookmark the permalink.